Fact: With available financing options of 0% APR and no out of pocket cost, savings in utility bills could offset payments. Once installed, solar panels provide a source of free electricity resulting in lower utility bills and reductions in dependency on the electric power grid, and if you live in a state with high tax incentives, the payback period can be as short as 2 to 4 years. Myth: Solar Only Works in Warm Climates. Fact: While sunny states like California lead the U.S. in solar deployment, northern residents still have much to gain from installing residential solar panels. Just as people don’t require full sunshine to see, solar panels don’t require full sunshine to produce electricity. Fact: Solar panels have no moving parts and do not require regular maintenance. Solar systems come with monitoring software that allows you to spot any drops in power generation right away. Typically the recommendation is to hose off the panels once a year or so, but many panel owners actually never clean the panels and instead rely on the rain to do the job for them. Myth: Installing Solar Panels Will Increase Your Property Tax. Fact: Installing solar panels will increase the value of home and will not cause reassessment of property. Reassessments are triggered by room additions or other construction that increases the square footage of the structure. In most states if a property assessment is triggered, the addition of solar panels are exempt from property taxes. Myth: Solar Panels Will Look Ugly On Your Roof. Fact: Many home buyers see solar as an attractive green statement, so your home might sell faster than another in your neighborhood. 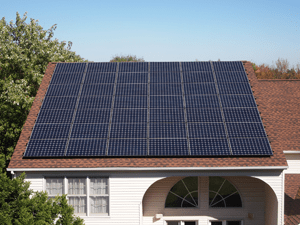 For homeowners who don’t like the look of traditional solar panels, there are solar panels available that blend in with the look of your roof.